Whale sharks, the world's biggest fish, migrate to the tip of the Yucatan peninsula, about 75 miles (120 km) from Cozumel every year and usually arrive around the middle of May. They only stay until mid-September, so if you're visiting during this window of opportunity grab your bucket-list experience fast! Take the tour from Cozumel by ferry and ground transfer or with a 20 minute scenic flight (see options/prices below). When you arrive, you board your boat for the 4 hour whale shark tour, which includes experienced multilingual guides, plenty of time to have a close encounter with these amazing creatures, snorkel equipment, drinks and sandwiches. The tours first started when local fishermen noticed the amazingly friendly behavior of these huge spotted sharks, they are in fact the world's largest living fish species. Nature is amazing in this area where the Caribbean Sea meets the Gulf of Mexico. The beaches have fluffy white sand and shallow waters, and further out are pretty reefs and amazing marine life, like whale sharks and manta rays. The expert crew will use their years of experience to find the whale sharks on the surface in the area, then you can enter the water in controlled groups to swim and snorkel with these gentle giants. The feeling of being in the water so close to such a giant creature is a vacation memory you will never forget! If time allows after the whale shark swim you'll stop at a beach on Isla Mujeres or Holbox to try seafood ceviche and relax before crossing back to the mainland for your flight or ground transfer back to Cozumel. The tour by air has its meeting point at Cozumel Airport at 7am and takes off with a 20 minute scenic flight over the coast of the Yucatan peninsula in a small aircraft, from Cozumel to Cancun airport. You fly low enough to enjoy spectacular views! If you're visiting on a cruise ship and due to dock before 9am local time then we can arrange a private tour just for you for a supplement, contact us for more information. After landing at Cancun's domestic terminal, you have a 20 minute transfer to Punta Sam where your fast boat from Isla Mujeres is waiting to take you on an unforgettable whale shark tour. The way back is the same in reverse, but you stop at Isla Mujeres if time allows, then cross to Punta Sam and head to Cancun airport for your flight back to Cozumel. Round trip flight Cozumel-Cancun-Cozumel in small aircraft, ground transfer to Punta Sam. 4 hour whale shark tour by boat. Snorkel equipment, multilingual guide, drinks and sandwiches. Stop at beach for seafood ceviche if time allows. Tour lasts approximately 7½ hours in total. Comfortable walking shoes and light, long clothing (so you are covered and can put minimal sun lotion on before entering the water. Not everyone does this, but the lotion may be bad for the whale sharks so we recommend it). Swimsuit, towel and change of clothes. Wet suit and snorkel equipment if you want to use your own. Cash for optional gratuities and souvenirs. This tour finds whale sharks 99% of the time. However, nothing is 100% guaranteed with Mother Nature, so in the very unlikely case of your tour not finding whale sharks we will offer you the chance to go on the land tour the following day for free. (Sorry, unfortunately this does not usually work for cruise passengers as most ships only stop in Cozumel for 1 day). Please follow the whale shark tour rules at all times and please advise us or the authorities if you think there has been any violation of the rules. If possible, please take photos and note the number of the boat that you think has violated the rules. Private tours are also available. Contact us for more details. Private tours may choose a different departure time. Minimum age 5 years, children pay full price. Minimum 3 passengers, available for 2 passengers with an extra $62.00 per person supplement. This tour is available for cruise ship passengers, we can adjust tour duration and departure time to your docking schedule. Contact us for more details. The flight from Cozumel to Chichen Itza and back has a height of 1,500 - 2,500 feet, which is a low flight. To be extra sure there are no problems for divers, the local hyperbaric chamber recommends 12 hours between your last recreational, no-decompression dive and the flight to Chichen Itza. 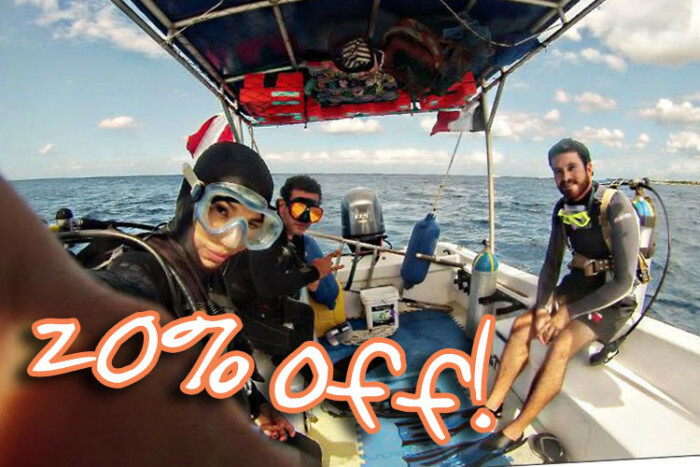 Normal dives on Cozumel are no-decompression dives; you can enjoy a normal day of diving before taking the Chichen Itza by Air Tour. You should be out of the water at 7 pm the day before the flight; night dives are not recommended on the night before this tour. Whale Shark Tour by Land/Ferry from Cozumel - $169 per person. This tour starts from the ferry dock at Playa del Carmen, you should take the 5.45am ferry (not included) from Cozumel so you are at the meeting point on the Playa del Carmen ferry pier at 6:25am. A private A/C van will transfer you in about 1 hour to Punta Sam where your fast boat from Isla Mujeres is waiting to take you on an unforgettable whale shark tour. The way back is the same in reverse, but you stop at Isla Mujeres if time allows, then cross to Punta Sam before the transfer back to Playa del Carmen for your ferry. Round trip ground transfer from Playa del Carmen to Punta Sam where the boat departs. Transport to/from ferry pier or ferry crossing to Playa del Carmen (approx. $20 per person). Buy one-way ferry tickets as you may return with a different company. Tour lasts approximately 9 hours in total, returning to Playa del Carmen around 4pm so you can be back in Cozumel by about 5pm (subject to ferry times). For every confirmed booking you will be required to print a voucher which is presented at the destination. You will receive your voucher via email once your booking is confirmed. Complete operator information, including directions and local telephone numbers at your destination, are included on your voucher.